So there are several odd things about every city. Old, creepy stories, legends and haunts. Portland is no exception and thus our series on "Portland's Strange Places" continues here with installment #3. This time around I am focusing on a truly wild store called the Freaky Buttrue Pecularium and Museum. Tucked away on NW Thurman St. in PDX (2234 NW Thurman to be exact), one must visit this bastion of oddities to truly appreciate it. I'll do my level best here, though, to provide a taste (pun-intended, see below) and (hopefully) ample provocation. Famed and yet unknown Portland adventurer Conrad Talmadge Elwood had a dream, but forgot it when he woke up. Still he spent a life time traveling the globe in search of the inexplicable and the freaky. 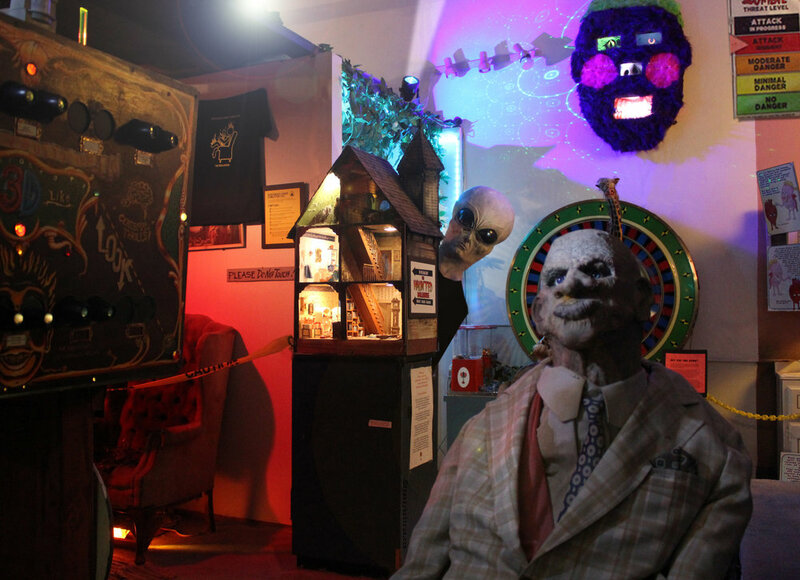 Established in 1967, The Freakybuttrue Peculiarium is a one-of-a-kind store and snack bar devoted to Elwood’s blurry vision. Eat Bugs, Get a Club Membership? So viewing strange things is one thing, but how about tasting them? Yes, the Freaky Buttrue Pecularium prides itself of its offering of "light snacks" on-site. But wait, these snacks are not popcorn and candy...they are insects. Yes, your read that right. Begun in 2011, a club called Insectatarian was formed and is thriving to this day. The basic angle here is "come eat bugs, join our club." Depending on how hungry you are, well, this may just be a non-starter. And yet, Portland is a food-adventurous city... Personally, I've eaten a chocolate-covered ant...and it was quite good. Beyond that? nothing. Perhaps some chili powder crickets at the Pecularium are in order? Hours: 10 a.m. to 8 p.m. Every Day - Summer Hours Only. Check back for Fall/Winter hours updates. Entry Fee: $5 per person. That said, a decent costume will get you in for free. We are located at 2234 NW Thurman st., in Northwest Portland, Oregon, 97210, just off 23rd Avenue.